Fill a large bowl halfway with water. Squeeze in the lemon juice from the lemons. Add the lemon halves to the water. Remove any tough or broken outer leaves from the artichokes and trim the tops with a sharp knife. Cut the stems to 2 to 3 inches and peel the remaining stem, if needed. Place each artichoke in the lemon wateras you prepare them this prevents discoloration. Combine 1/2 cup of oil with the parsley, basil, garlic and salt and pepper to taste in a small bowl. Pour the matzo meal into a shallow dish and set aside. Drain the artichokes. Holding each artichoke by the stem, press the top flat against the work surface to spread open the leaves.Spoon in some of the olive oil dressing between, then roll each one in the bread crumbs to coat evenly. Heat about 1/4 inch of oil in large, heavy bottom pan over medium heat. 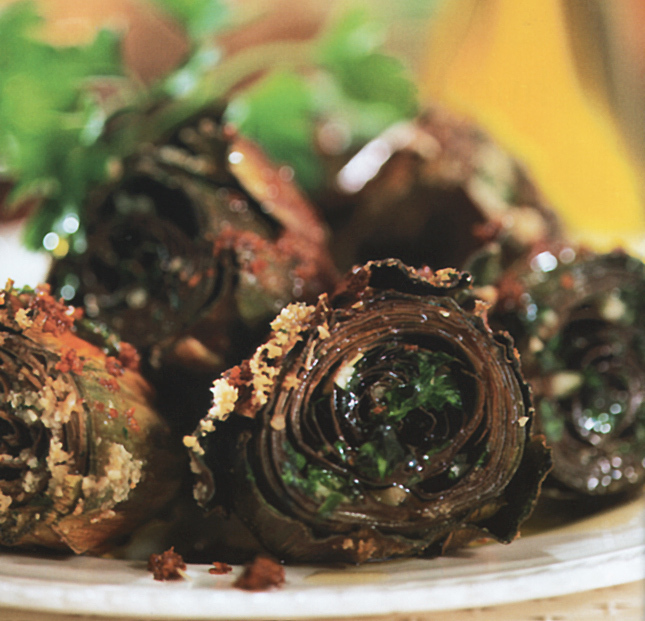 Arrange the artichokes in the pan in a single layer and cook covered, for 25 minutes, or until tender and golden brown, turning 3-4 times to brown evenly. Transfer to a serving plate and spoon over any pan juices or drizzle with fresh oil and leave to cool to room temperature before serving. Garnish with basil or parsley. I strongly recommend using small, long purplish artichokes carried by most Italian specialty stores. If you use large artichokes you must remember to trim them carefully, remove the outer leaves and hairy choke.